A customer recently shared a story with us about results they had gotten from taking an online color vision test vs results they received from a physical test. I have taken this [analog] color acuity twice at a job site this year. First time I scored a 75, the last time I scored a 100. A 75 is tough to fathom, and a 100 definitely is. Would a 100 mean I am color blind? When I got back home I looked it up online and took it there. First test online was a perfect 0. I just took this test again and scored a 24. The difference between the test are the ones at home were with no glasses and ambient light on a 22” monitor. Any information would be helpful. With the proliferation of color displays, i.e. computer monitors, mobile devices, etc., that surround us on a regular basis, it makes sense that we would want to utilize them for color vision testing. The idea that displays have the ability to evaluate color blindness or color vision deficiencies seems like a sound concept, however, when it comes to judging the subtitles in color discrimination for an individual, the capabilities of these displays can be greatly lacking. The reason for this is that every display, whether it is a PC or an iPad, has slight variations when it comes to reproducing color and color will depend on the individual’s display settings; on top of that, most of us do not have our monitors calibrated. This means online color testing is not scientific nor does it give you true results. When using a physical test, these issues no longer exist because a physical test will reflect and represent the same colors. For any color vision test to be reliable, consistency is crucial; colors must maintain the same relationships from individual to individual to ensure that the results are analogous. The FM 100 hue color vision test offers more than a pass/fail response; it gives a result that is scaled to the individual’s capabilities. This allows the results to be comparable from one individual to another. While the digital tests are fun to take to compare with your friends results, remember that the results from the online color test will not necessarily be accurate. The Farnsworth Munsell 100 Hue test is a great tool to use when you are looking to evaluate the ability of an individual to communicate subtle differences in color. With physical color tests, you can evaluate how well they can see those differences and if it is similar to others or not. I could definitely see the difference between the segments on my Acer 21″ LCD ($200), but the score said 7. Wiki states that different monitors will have an effect. This online test may be a better test of your monitor/video quality than anything. The true test would be with prepared tabs in a test kit with preferred lighting. 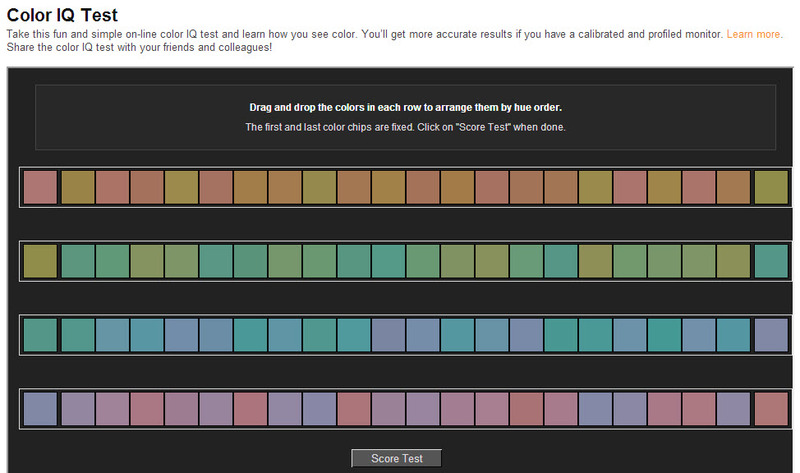 I think if you got between 0 and 24, your color vision is good, and your monitor was good. If you are working under certain light sources, that are known to project unequal wavelength light, then you are at a clear disadvantage. I think the online test is easier because in the physical test the color discs are surrounded with the thick black margin of the cap. They are therefore isolated from one another. In the online test there’s no meaningful margin between the colors, which allows you to bring them very closely to one another, making comparison easier, in my opinion. Also, the physical test has time constraints that the online version doesn’t. where did you get this online test done Felix?